Brussels airport (BRU), our main airport. From this airport, the city centre can be easily reached with a 20 min. train ride. You can take the (only) train at the airport, and get off at station Brussel Centraal/Bruxelles Central. Brussels South Charleroi airport (CRL) You can take the shuttle bus from CRL airport to the Brussel Zuid/Bruxelles Midi train station. Once there, you can take the train to Brussel Centraal/Bruxelles Central. Paris-Charles de Gaulle (CDG) At the airport, follow the directions towards the Thalys train station. (This includes a 30 min. metro ride.) At the Thalys train station, take the train to Brussel Zuid/Bruxelles Midi (< 1.5 hours). Once there, you can take the train to Brussel Centraal/Bruxelles Central. Amsterdam Airport Schiphol (AMS) At the airport, take the Thalys train to Brussel Zuid/Bruxelles Midi (~1.5 hours). Once there, you can take the train to Brussel Centraal/Bruxelles Central. Brussels can be reached from Germany, France and the Netherlands with a Thalys train. In the UK, you can take a Eurostar train. Both the Thalys and Eurostar trains go to Brussel Zuid/Bruxelles Midi. Once there, you can take the train to Brussel Centraal/Bruxelles Central. The most convenient way to reach the conference venue from the city centre is by metro (~ 30 minutes). Take metro line 5 (Hermann-Debroux) at Centraal Station/Gare Centrale, and get off at station Pétillon. (You can buy tickets at the station.) Once you have arrived at Pétillon, just follow the <Programming> 2017 signs. Alternatively, you can also take metro line 1 (Stockel) at Centraal Station/Gare Centrale, and get off at station Montgomery. 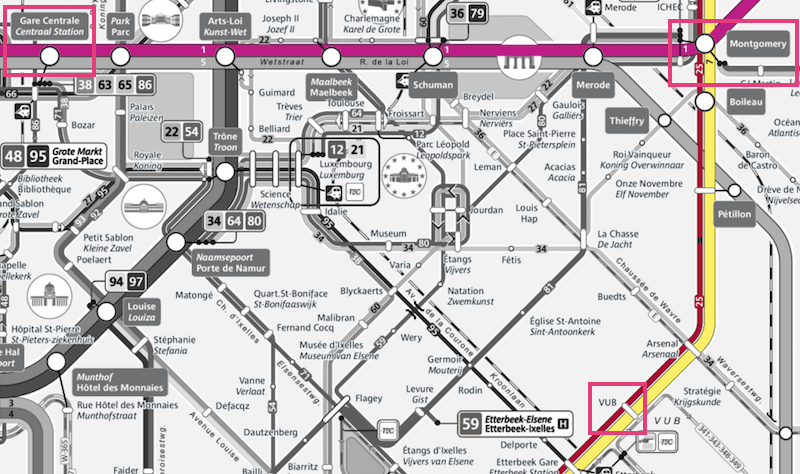 At station Montgomery, switch to tram 7 (Vanderkindere) or 25 (Boondael) , and get off at station VUB. Once you have arrived at station VUB, just follow the <Programming> 2017 signs. This trip also takes about 30 minutes.